We’d love your help. 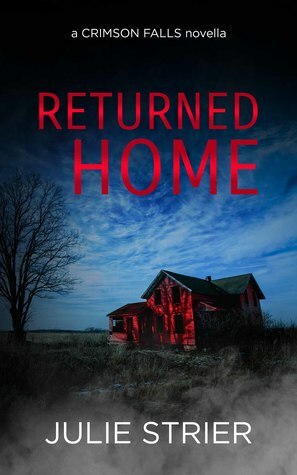 Let us know what’s wrong with this preview of Returned Home by Julie Strier. To ask other readers questions about Returned Home, please sign up. This was my first read by the author and it did not disappoint! The author's writing style grabs the reader's attention right from the start and does not let a moment for the reader to be bored. The story is action-packed and definitely keeps the reader on the edge of their seat. The twists and turns were excellent and the ending was great. I did not expect how everything turned out. Thank you to the author for the eARC as part of the Crimson Falls Blog Tour. I look forward to reading more from This was my first read by the author and it did not disappoint! The author's writing style grabs the reader's attention right from the start and does not let a moment for the reader to be bored. The story is action-packed and definitely keeps the reader on the edge of their seat. The twists and turns were excellent and the ending was great. I did not expect how everything turned out. Julie Strier has written the fifth story in the Crimson Falls series, Returned Home. This is my first story by Ms. Strier and she pulled me right in with her writing style and character creation. A page turner that kept you on edge page after page. Bounced around the foster system, Lilith has always wondered about her past. Constantly fleeing from a past that could catch up anytime, Lilith works away in a rundown diner. When she loses her job she leaves town with an engaging stranger. She al Julie Strier has written the fifth story in the Crimson Falls series, Returned Home. This is my first story by Ms. Strier and she pulled me right in with her writing style and character creation. A page turner that kept you on edge page after page. Constantly fleeing from a past that could catch up anytime, Lilith works away in a rundown diner. When she loses her job she leaves town with an engaging stranger. She always did plan on moving on afterall. They stopping at a road side motel for some much needed sleep, she may just find out about her past. But will she like what she finds in Crimson Falls? Another surprise ending, gotta love 'em. Five stars for this great suspense/thriller. I did receive an advance readers copy from the author and along with this honest review is a desire to read more from Julie Strier. The story of Lilith is one that will keep you enthralled and wanting more. Leaves your mind to wonder what happens next !!!! Loved the one twist that I never imagined!!!! 5+ stars for this one. Highly recommend this as well as the other books in the Crimson Falls Series!!! What happens when you accidentally find your roots? Check out another great Crimson Falls story! Strier has packed this novella with beautifully developed characters and stunning description matched with a foreboding mood and fast-paced action. It’s hard not to love Lilith, a rebellious, hardened young woman bent on running from her past. But when her past catches up to her, the shocking twists and turns are a thrilling ride. I can’t wait to read more from Julie Strier! I absolutely loved this story. Lilith and Ash meet at the diner she was working at. When she loses her job, Ash talks her into leaving town with him. During the drive, she tells him about the legendary town of Crimson Falls. They stop there to get some sleep. At the hotel, the lady recognizes her and tells her she is from there and she should not trust Ash. Deep down, Lilith always wondered about her real parents? Is she truly from here? Is she able to trust Ash? Absolutely lo Dark and mysterious. Quick read and a page turner for me. The twist surprised me as I had other expectations. Lillith was a strong individual, dealing with her unknown past and personal issues. I liked her spirit and even liked her favorite pastime. I look forward to reading more about this town in the other novellas and recommend this one. I received a copy of this story through Enticing Journey Book Promotions, and this is my unsolicited review. It took me a little bit to get into this one, but when I did, I finished in one sitting. Once Lillith started discovering where she came from the story quickly progressed, almost too fast, and we found ourselves trying to unravel the history of her family and past. There was a surprise I wasn't expecting and an ending that encompasses the evil that Crimson Falls really possesses. Always wanting to be a writer, Julie Strier grew up on a healthy diet of strange stories, mostly Stephen King, Dean Koontz, and Poppy Z. Brite. But it wasn’t until she wrestled with postpartum depression that her dream was born. A new mom struggling to find her identity, Julie found herself again by returning to the thing she loved - writing. Now she writes Writes fast-paced, action-packed fiction. When she’s not writing, she can be found keeping her energetic toddler from climbing the world, and hanging with her husband and dog. She’s also hopelessly addicted to knitting, music, and the internet.